In this work, an ion-imprinted fluorescent sensor by combining sol–gel processing and spin coating was developed. Fluorescent functional silane was first synthesized and reacted with tetramethoxysilane to obtain sol–gel-derived materials and then used as a receptor for selective removal and sensing of Hg2+ in aqueous solution. Ion-imprinted material synthesized in the presence of Hg2+ was characterized by Fourier transform infrared spectroscopy, scanning electron microscopy, N2 adsorption–desorption analysis and thermogravimetric analysis by comparing with non-imprinted material obtained in the absence of Hg2+. Surface area, pore volume and diameter were analyzed from the profile of nitrogen adsorption. 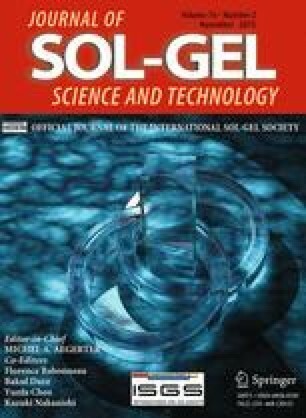 It was observed that fluorescent sol–gel film exhibits distinctive change in fluorescence emission upon interaction with Hg2+. Steady-state fluorescence experiments were performed for spectral characterization of the films, and the advancement of the reaction was defined. The shift in emission maxima and other spectral changes of the different matrices have been identified, and gelation time of sol–gel network was revealed by monitoring the emission of fluorescent silane in pre-gel solution. The corresponding selectivity factors of the imprinted fluorescent film toward Hg2+ against the other analogs were evaluated. The authors thank the Istanbul Technical University (BAP, Project No: 36236) for financial support. This manuscript submitted does not contain any studies with human participants and animals.